Home Did You Know What are Strakes? Strakes are small blade-like devices mounted on aircraft that enhance aerodynamics by directing airflow over certain control surfaces at specific angles of attack. This not only increases overall control authority, but increases safety by preventing loss of control at lower airspeeds. Usually located on the upper surfaces of the engine’s large fan section, these devices produce bands or ribbons of smooth airflow at high angles of attack. 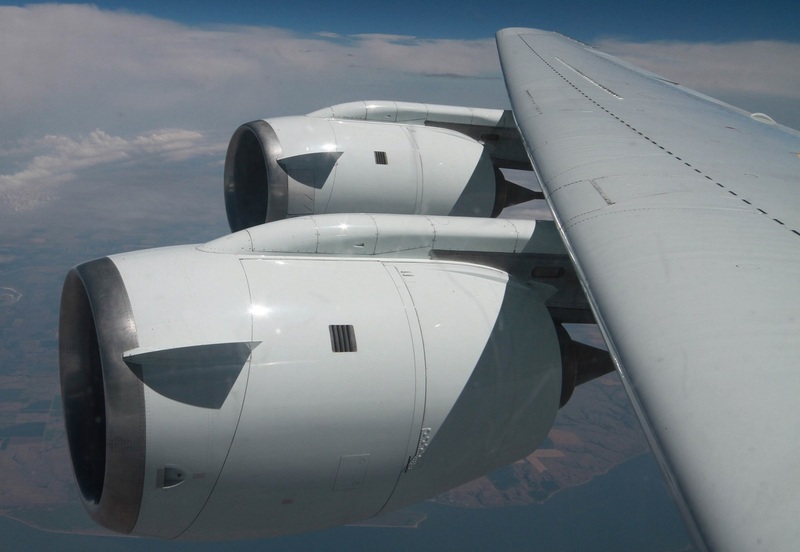 When directed over the wing, this airflow prevents aerodynamic burble from the large engine nacelles from blanking-out the wing’s inboard leading edges during takeoff and landing. On many wide-body jetliners such as the Boeing 777 and Airbus A380, engine strakes are located on the inboard side of the nacelles only. Strake size and location also depend on factors such as nacelle diameter, wing leading edge sweep angle, and distance from nacelle to wing. Graphic evidence of a strake’s airflow characteristics can be seen when the humidity is high enough for water vapor in these bands, ribbons, or tubes of low-pressure air to condense, forming visible proof of their functions. If you’re sitting by a window near the leading edge of the wing, it can be quite a show on takeoff or landing!